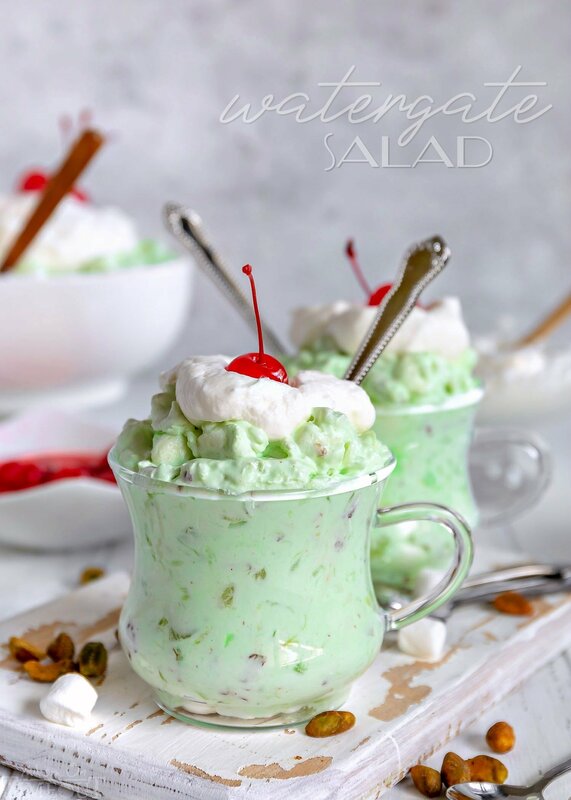 There is nothing better than Watergate Salad! This simple dump-and-go salad is a classic that makes it’s way into every celebration because it’s both incredibly delicious and incredibly easy. Whip it together in less than 5 minutes and you’re good to go! 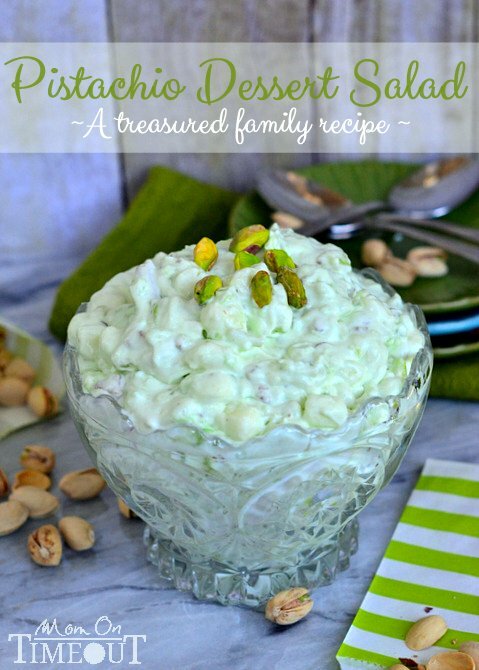 Love pistachio? Make sure to try my Easy Pistachio Pie and Pistachio and White Chocolate Pudding Cookies too! 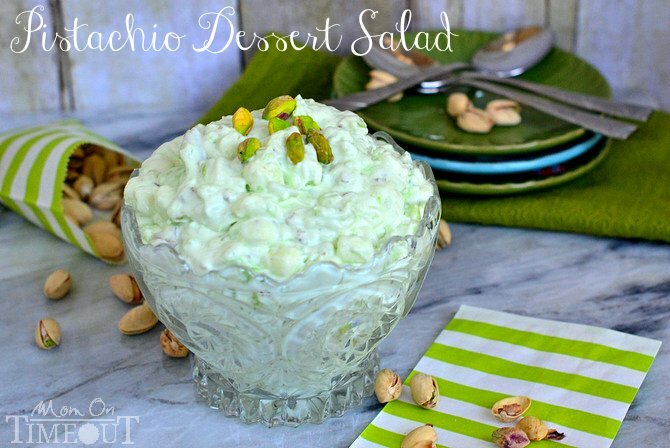 Pistachio Dessert Salad, Watergate Salad or Pistachio Fluff – whatever you choose to call it – it’s delicious! I mean, what’s better than dumping a handful of ingredients together in a bowl, giving it a quick stir, popping in the fridge to the chill and then having it ready to go when you are? The answer? Nothing. 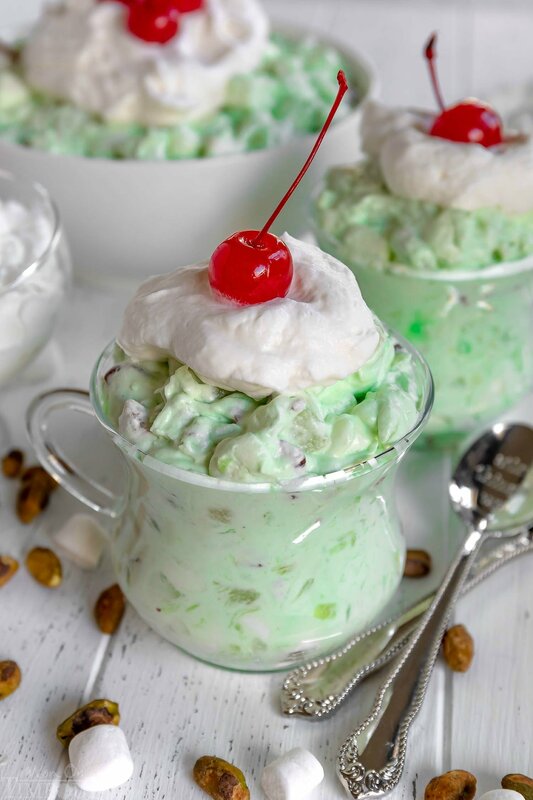 Especially when you end up with a deliciously sweet and satisfying Watergate Salad for that teeny amount of effort. There is never a single bit leftover. Never. Takes about 5 minutes to make. Cheap. Like, really, really cheap to make. This is basically the criteria for all my life choices. To top it all off, this is pistachio flavored! I looooove pistachio! Not a whole heck of a lot you guys. We’re talking 5 ingredients. TOTAL. crushed pineapple – in juice! Do not drain! Family recipes are the best. Seriously. I mean, if we’re talking food that brings back the memories, it’s got to be a family recipe. Last month my little sister was out visiting and we made the rounds to all the local relatives so they could visit with Ashley. We met up with my Aunt Lana and had a wonderful visit. I’ve already made several of the recipes already and if I hadn’t needed to feed my hungry family before I could get some pics – I would certainly have shared 🙂 This one I made in secret and snapped a few quick pics while the boys were away. As soon as they find out there are marshmallows in here…yeah, it’s not going to last long. Some people ask for watergate salad without pineapple. This is definitely not it! I use the pineapple and it’s juice to dissolve the pudding mix. 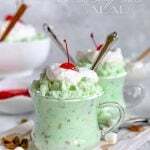 You can also make watergate salad with cottage cheese. It’s a lot like my Tropical Orange Jello Salad. 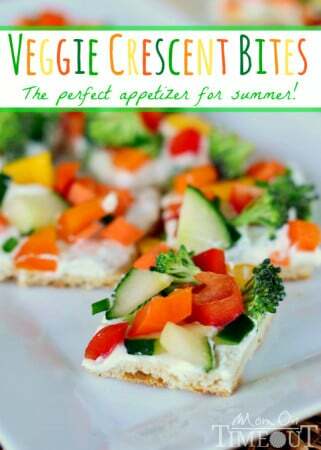 You can add a cup of cottage cheese to this recipe if you like. 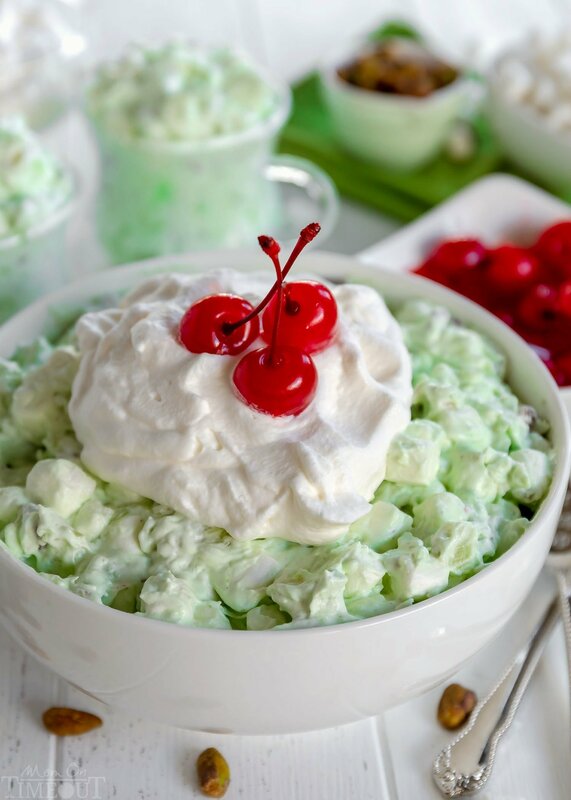 There is nothing better than Watergate Salad! This simple dump-and-go salad is a classic that makes it's way into every celebration because it's both incredibly delicious and incredibly easy. Whip it together in less than 5 minutes and you're good to go! Combine pudding mix, pineapple (with juice), marshmallows and nuts in a large bowl and mix well. Blend in Cool Whip and chill until ready to serve. Originally published August 11, 2013. Updated March 24, 2019. What are some of your favorite recipes that show up time and again at family functions? Thank you so much for this recipe! I’m going to serve it for our New Year’s Day brunch. I have only had it yearly at a friend’s party. People will love it! 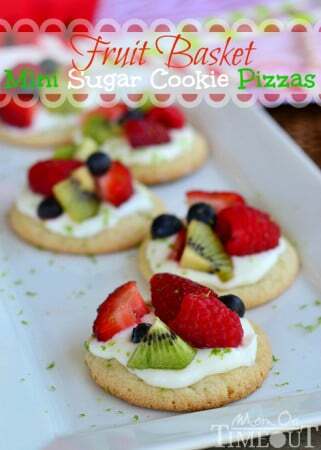 Add 1 pound of seedless green grapes, sliced in half … BETTER than marshmallows! Or add both. This is the way my family enjoys Watergate Salad! I make this with your recipe all the time. This past week I did something a little different, I add Christmas mini marshmallows and put the fluff in a graham cracker crust pie tin. I like the ones that you can purchase already made. My neighbors loved it. 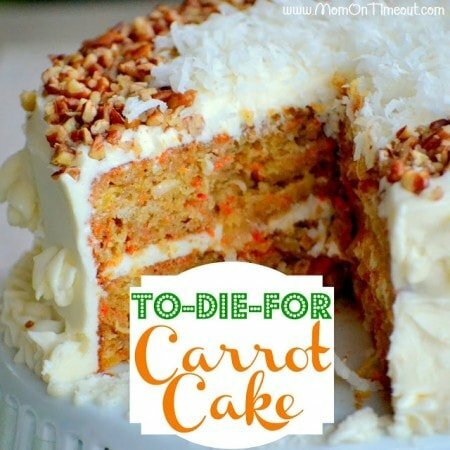 Thank you so much for posting this recipe, because (although I use to make this all the time) I forgot how to make it. Been a long time since I made it. Now thanks to you, I can once again make this over and over for my family. We truly love it! Hope your Thanksgiving was great. Sour cream works great in the pistachio fluff if you don’t have Cool Whip, you might need to add a tablespoon or two of milk if it’s too stiff. I don’t eat Marshmallows.Any suggestions what I can replace Marshmallows with? Your cherry fluff had condensed milk in it. Will it be tastier if I add condensed milk to this as well? If you don’t eat marshmallows because of the gelatin/animal products, try the Trader Joe’s min marshmallows. They are vegan. You can find them toward the end of the year. In the summer, they sell only the large ones, for campfires. Both vegan. I just made this for our families Easter and it tastes fantastic! Thank you for sharing!